The Community Pride Committee's goal is to further improve the grace and charm of our great City. The Committee is made up of ten community members appointed by the City Council. The Planning Commission's primary functions are to supervise the Placerville Zoning Ordinance; adopt rules and procedures necessary or convenient for the filing of use permits, variances and site plans; act upon all applications for use permits, variances and site plans; make recommendations to the Council upon amendments to zone changes or to changes to the provisions of this Ordinance. The City of Placerville Recreation & Parks Commission is a six (6) member commission made up of five (5) community members at large appointed by the Placerville City Council and one (1) student representative from El Dorado High School. The Recreation & Parks Commission acts in an advisory capacity to the Placerville City Council and the Director of Recreation and Parks in all matters pertaining to parks and public recreation as the city works to deliver quality parks and leisure services to the community. This Committee is currently inactive. The Historical Advisory Committee's major function is the preservation of historic resources, including buildings, structures, objects, monuments and markers as our legacy to future generations. Established by City Council Resolution 7964, Jan. 10, 2012. 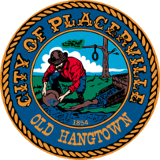 The purpose of this seven-member, Council-appointed committee shall be to provide advice and recommendations to the City Council on economic development issues and assist in the development of an Economic Development Strategy for the City of Placerville. The Measure H/L Sales Tax Committee’s major function is to ensure the accurate collection, accounting and expenditure of Measure H and Measure L Tax funds. The duties of the Committee may include the following: Act in an advisory capacity to the City council in all matters pertaining to the Measure H and Measure L Sales Tax; prepare a written or oral report of findings to the City Council following each quarterly meeting; perform any other functions that may be designated by resolution or motion of the City Council.